Pilar Touch-Activated Faucets From Delta | OhGizmo! 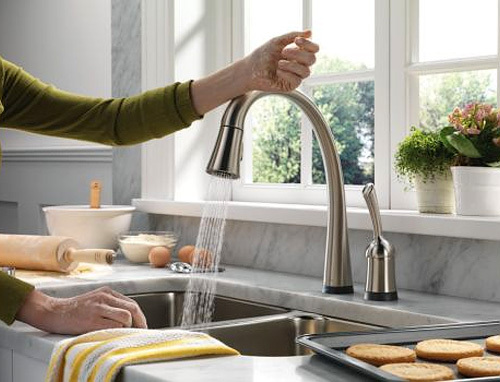 Instead of fumbling with handles while your hands are dirty, spreading the mess everywhere, Delta’s new Pilar faucets feature the company’s Touch20 Technology which lets you simply tap or touch them to turn the water on or off. The faucets use two capacitive touch sensors in the handle and the spout to detect when you’ve touched them, but are smart enough to know when the handle or spout have been grabbed instead so you can adjust their positions without turning the water on or off. A chrome version of the Pilar faucet will set you back $495 while the stainless steel model is a bit more at $547. I've got something that's touch activated! Huh! Huh! Ladies?! Woo Hoo! Cool product. The ironic part about is though is that if you want to change the temperature you still have to grab the knob. Not everything needs to be touch. My 11 year old saw this online and desperately wants one for her bathroom for Christmas. A little steep in price but definitely a buy if it's falls to about $200-$250. I'd even get one for the kitchen. I'm just a little curious, what's better about this than a motion controlled? Why don't they just do an IR-activated version since that technology exists is bathrooms around the world and can't be too expensive. It might save some water, too. Interesting but how do you move the faucet without turning it on and off? Eh while this seems like it might be useful, I would imagine it make a bad habit of wasting water for the owners. The one reason you don't want to touch the faucet would be while cooking. Therefore as a cook, you usually use a towel or rag to wipe your hands prior to using the faucet. Eliminate that and you would be constantly running your hands under water instead. Maybe I'm just crazy but hey will all this green, eco-friendly technology lately, this doesn't seem to fit in. And so timely, with swine flu issues looming. Nice… I'm getting this for the new kitchen! That’s really cool. I have always thought that touching the handles when my hands were messy sucked, but never thought something like this was possible. I would love to have this in my house, but I will need to save up for it first. because this does not turn off when you wash the pots in the sink. this is an awesome device. we had one for 18 months and it’s failed. i called Delta and they sent out a $200 part (solenoid and electronics) for free. BTW, the price is down to $350, and it’s a little more complicated to install than a standard faucet, but well worth it. the water temp is whatever the last person used, so make sure to set it to cool or you can burn someone. not really an issue in our house, but with small kids it might need some teaching.